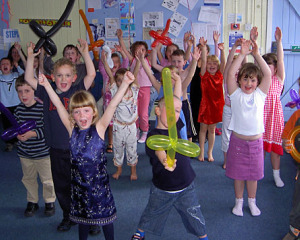 Common Childrens birthday party games include musical chairs, pass the parcel, musical statues, pin the tail on the donkey, hide and seek. Here are some that are not quite as well known. CHINESE WHISPERS Quiet childrens birthday party games! All the kids sit in a circle. One thinks of a sentence, saying or phrase, and whispers it to the child next to them. This child then whispers what he heard (or thinks he hears) to the next child. This continues right round the circle until the 'chinese whisper' arrives back at the first child, who has to say it out loud, Usually nothing like the sentence you started with! French Bean – hands on hips and shout "Ooooh La La"
THE GIANT MEMORY GAME Again every-one sits in a circle. The first child has to say the sentence 'I went shopping and I bought.....' They have to finish the sentence with what they bought, for example bananas. The next child then has to say out loud 'I went shopping and I bought bananas and........' finishing the sentence with their own choice of item. After a few goes the list might look like this... I went shopping and I bought bananas, a tin of beans, a birthday present for John, 20 pegs, a kilo of apples, a new mop and so on. BRITISH BULLDOG Tiring childrens birthday party games! You need a large space for this. One or two guests, are chosen to be 'Bulldogs'. The bulldogs stand at the centre of the space. The rest of the guests stand at one end of the space (home). The aim of this game is to get across the space to the other side, without being caught by the bulldogs. If you get caught you become a bull dog your self. The guests, starting from the other side then have to get back to the other without being caught. The winner is the last person to be caught. This is quite a physical game! MURDER IN THE DARK You need a very dark room or rooms for this game. Prepare enough slips of paper for every guest. Mark 1 slip with a circle and 1 with an X, the others should be blank. Fold so the mark is a secret. Every guest chooses a slip of paper. The guest choosing the X is the Murderer but keeps this a secret. The guest who is the gets the O is the 'Police Officer' and tells every-one else this.The lights are turned off and the guests circulate around the room or the house. The murderer chooses a victim, by firmly tapping them on the shoulder. The victim should then scream as if dying and the murderer moves away. Traffic Lights This game can be played to music. There are five colours: red, amber, green, purple and pink. The children need to remember what action goes with each colour. Red is stop, amber is sit down, green is run, purple means jump and pink is hop furiously. When the music stop an adult needs to shout out a colour and the kids have to do the selected action. Those who get the action wrong are out, and the music starts again.